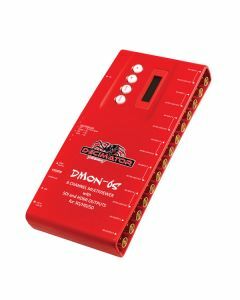 Decimator Design’s DMON-6S is an indispensable tool in the field and studio thanks to its flexibility, compact form factor and ability to be operated without need of a computer. The six channel multi-viewer with HDMI and SDI outputs can be utilised as such, from one to six channels, or as a six to one input multiplexer. The unit delivers six independent SDI inputs with active loop through outputs or, alternatively, view all six inputs on an optional monitor. As mentioned, it’s also possible to multiplex six input signals, creating the potential to transmit the six SDI signals over a single output. Decimator Design’s converter also supports audio embedded in the SDI stream, and RS422/485 protocols that permit the selection of tally display and control UMD position and size. The DMON-6S’ built-in LCD menu screen and control buttons allow you to access menu functions without necessitating use of an external computer or DIP switch to access settings. The multi-view output simultaneously displays, and is compatible with, inputs of different formats and frame rates and the pass-through mode allows any of the six inputs to be selected for output via the SDI and HDMI outputs. There’s also the option to select from display presets or to create and save your own custom layout. Up to 32 GPI also means you can interface with optional devices for tally and remote switching. The DMON-6S is a truly portable converter, that incorporates our new easy to use LCD and button control system. This gives you easy access to most of the amazing features without using complicated LED/button control, dip switches or having to carry around a computer to change a simple setting.